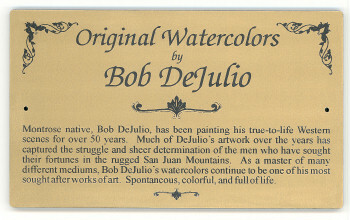 NAMEPLATES FOR ART OR ANY USE: You decide the look and width that fits your needs! a brassy/gold colored lettering when it's laser engraved. SIZE: 3/4" (19.05mm) HIGH by up to 6" (152.4mm) wide. Note: Price is based on a size of 3/4" x 3" - price increases with each 1/2" increment of width. Metal thickness: 0.020" (thin enough to go on a matte board, sandwiched under the glass). length of your message text can be increased by about 4 characters per 1/2" (12.7mm) of width. presentation of your custom engraved message with one of the available font choices. A DISTANCE. WE ALWAYS USE OUR BEST JUDGEMENT ON SIZING TEXT TO FIT. peel-n-stick adhesive option (approximately 2mils thick). FAST SERVICE! Most nameplate orders ship within 24 hours. the message text to be engraved on your Metal Nameplate. It's just that easy. * Need further customization for your nameplates? We're just a phone call away. * These metal nameplates are for interior use only. They are not intended for exterior applications. * Quantity discounts are available for large orders of identical nameplates. Please call. This product was added to our catalog on Wednesday 28 September, 2005.